If your loved one was seriously injured in an amusement park accident, contact Carr & Carr Attorneys today to learn what legal options you have. Summer fun means amusement parks for many families. Whether it’s a at local water park, a traveling carnival in a rural community, or a thrill ride at a vacation destination theme park, you expect the ride to be safe. Unfortunately, that’s not always the case. When safety rules are not followed, innocent people get hurt. Falling or being ejected from a seat, cable car or train — The metal bar that the ride operator is supposed to check can become loose and not hold you in your seat. The result of being thrown out of a seat can be broken bones, head trauma, internal injuries. Electrocution or electric shock — Because thousands of volts of electricity provide power for rides to start, spin, fly and stop, you could get a dangerous amount of electric current through your body if a ride malfunctions. You don’t even have to be on the ride to be hurt; since electricity travels, you could receive a jolt if you are leaning on a nearby metal fence, for instance, which comes in contact with live wires. Collision with moving cars or swings — A roller coaster car or other moving seat can weigh hundreds of pounds, maybe even more. Some cars are suspended from cables which can break, causing the car to break loose. Some are attached with nuts and bolts that perhaps were not assembled safely; maybe the carnival worker rushed too quickly put the ride together or got careless after assembling it dozens of times. Any of these, and more, can lead to devastating injuries. Severed limbs and decapitations — Taut metal cables hold moving cars and other ride parts in place, but when a cable breaks, the force of the swinging metal can easily sever limbs. Drowning — Log rides can be refreshing summer fun, but rushing water, unknown surroundings, suddenly being submersed and heavy artificial logs are a potentially deadly combination. Unfortunately, some owners of amusement park rides seem to have little regard for passenger safety. Rides should be checked, secured, double-checked, verified, inspected, examined, monitored, reviewed and then triple-checked for safety. If operators and owners follow safety rules and procedures, riders should not be hurt. 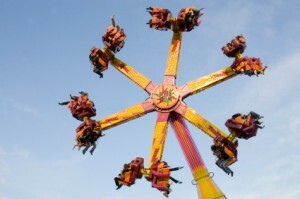 If you or a family member has been hurt on an amusement park ride, contact the personal injury lawyers at Carr & Carr Attorneys. We work with families who have been injured due to the carelessness of others. For a free, no-obligation consultation with an attorney, fill out the contact form on this page or call 1-877-392-4878 today. With offices in Oklahoma City, Tulsa and Northwest Arkansas, we can help you no matter where you live across the U.S.